Z'EV is a long running sound artist, sculptor, writer with a history that predates the original industrial milieu where he made his name. 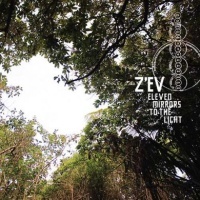 Of all the artists wonderfully documented in the RE/Search Industrial Culture Handbook, Z'EV more than the other artists has arguably stayed true to his original intentions, quietly honing his skills, techniques and knowledge of the arcane and esoteric. A prodigious collaborator in recent years he has worked on recordings with Nick Parkin, Boyd Rice, Charlemagne Palestine and in live improvised performances with Chris Watson, IOIOI. In 2012 he launched a successful kickstarter campaign for his cine-cussion project, based on cymatics exploiting the phenomena of modal/wave geometric patterns emerging from vibrating surfaces. He remains best known for his percussive work using industrial and ritual elements but his work has also dealt with transformation best represented by the drones and atmospheres of his solo work. Eleven Mirrors To The Light is the third and final part of a series of releases for Cold Spring that began with Sum Things and continued through A Handful Of Elements. Eleven Mirrors To The Light is an alchemical exploration of the intersection of light and dark. Drones, textures and harsh atmospheres play a pivotal role on Eleven Mirrors To The Light. There's little obvious evidence of the industrial metal percussion that he is often associated with, and resulted in him being cited as an influence on the likes of Einstürzende Neubauten and Test Department. 'Speil' does however convey the ritual aspect of Z'EV's music; it seems to use singing bowls, heavily processed with subterranean gurgling but most of Eleven Mirrors To The Light sees Z'EV's percussion pushed into stretched and processed waves of sustained resonating tones, textures and sounds. Eleven Mirrors To The Light deals with transformation, and the "waves of luminescence between prisms and mirrors that fragment particles into shimmering washes of sound". In fact, most of the eleven track titles translate into light, mirror or glass. 'Aina' the opening track features surging passages of glistening drones pierced by the occasional sound crash, while 'Eadrom' is awash with rickety textures, discordant hues and rattling percussive flourishes. There's clarity in the crisp production values of Eleven Mirrors To The Light but I'd be interested to know the sound sources, the instruments used and how the sound is processed but none of this is listed in the credits. At times it plummets to the subterranean depths of Lustmord, but even when they do such as on 'Feny' the cavernous drones are imbued with a spiritual essence, contrasting with an undercurrent of storm like distortion. The beautiful indistinct melodies that radiate during its cyclical meditative drone are startling. The deep resonating drones of 'Mirall' are so subdued and distant you'd be hard pressed to guess it was Z'EV. A more percussive element comes to the fore on both 'Svetlo' and 'Espejo'. Amidst the airy strain of grating and heaving drone shudders of 'Svetlo', there is the chatter of percussive implements, while a rhythmic metallic clank permeates the swirling experimental time stretches of sound of 'Espejo'. Within its expanse of glistening layers, on 'Marama' it's obvious that Z'EV is dealing with light, with sounds set through a prism creating sharp, glazed tones. Also dealing with light is 'Golau' but here the sound opts for queasy experimentation and shifting sound layers. 'Salamin' meanwhile is more ominous, merging dark rumbles with high end grating shimmer, tending towards a more flowing liquidity. It is industrial in the sense that it sounds like the machinery of a glass cutting factory. Despite the myriad of sounds and textures that come before, Eleven Mirrors To The Light closes on the flitting sound shifts and reflective reverberations of low end percussive devices of 'Kathreftis'.